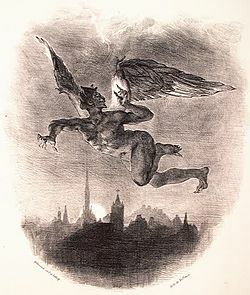 The legend of Faust revolves around a pact with the devil struck by the central character of the same name. A magician, Faust had studied his art for years but had made little progress. Frustrated, he uses black magic to summon the devil who agrees to assist him in exchange for Faust’s soul. The deal becomes trying for Faust as the devil proves to be a difficult partner. The tale of Faust has taken many forms but any deal or bargain where someone relinquishes their claim to the rewards that attach to leading a pure or moral life in exchange for power or material success today is often regarded as Faustian. Modern tales of success follow a different arc, that of the self-made man. The mainstream media, particularly the business media, and for that matter, scholarly journals devoted to business often attempt to identify what it is that makes some business leaders more successful than others. They, and the public at large have a particular fascination with the superstars; people like Steve Jobs, Bill Gates, Richard Branson or Jack Welch. Certainly these business leadership icons appear to have been struck from markedly different moulds but the prevailing wisdom would suggest that they all share certain characteristics and that they are exemplars of some combination of most or all of them. Understands corporate social responsibility and embeds it. Now imagine that you’re chairing a hiring committee charged with finding a new CEO and one of the résumés that you’re asked to consider belongs to someone named Lance Armstrong. Yes, that Lance Armstrong, the famous cancer survivor and now-disgraced cyclist who for years denied that performance enhancing drugs played any part in his success and who never backed down from a fight with his critics or detractors. Easy decision, no? Just toss his résumé in the garbage can. After all, he’s a fraudster, a liar, a cheat, and he really hurt large numbers of people including teammates, associates and sponsors. He also betrayed the faith of countless people who looked to him for inspiration while they or their loved ones fought their own terrible battles with cancer. But maybe it’s not that simple. I’m not going to argue that Armstrong shouldn’t pay the price for his misdeeds – many of his contemporaries in the cycling world have been stripped of their medals or titles because they were caught doping and he deserves the same punishment. What I will suggest is that Armstrong’s record of success is at least as impressive as that of many other public figures and he shares many of the same traits that we typically laud as positive contributors to their success. The big difference is that Armstrong chose to make his mark in an arena, professional cycling, where success depended not only on the possession and exercise of those very important traits but also on the willingness of participants to make a modern-day Faustian bargain – you had to cheat if you were to have any chance of winning. In his confessional interview with Oprah Winfrey, Armstrong stated that he did not believe it was possible during the time he competed for him to win the Tour de France seven times without doping. This has been the sorry defence that his supporters have been putting forward for some time; everyone was doing it so, if he doped, he only did it to level the playing field. It is a morally bankrupt position and indefensible. But let’s set morals aside and consider the journey that led Armstrong, and large numbers of his peers, to a meeting with the devil and a decision whether or not to follow him down a different road. Cycling is a grueling sport and the Tour de France an almost inhuman event. The foundation for success in cycling, assuming one has the provenance of a suitable physique, is years of arduous training and almost unimaginable sacrifice. Cyclists are whippet-lean and must live an ascetic life. They must avoid excess weight at all costs because it takes too much energy to carry that weight over long distances and up punishing climbs. They must have the ability and the will to suffer. They must be able to respond at the moment they feel they have nothing left to give, with another push, another gear. You need only look at photos or videos of cyclists grinding up a climb or trying to outrace their competitors in a stage-ending sprint to appreciate how physically and mentally tough they have to be. The marquee event in cycling is the Tour. Run over twenty-three days – twenty-one days of stages and two rest days – and covering about 2,000 miles it also requires riders to climb thousands of feet in the Alps and Pyrenees mountains. It is a storied event and many of its champions are the stuff of legend. The Tour is not the only great cycling test, the Giro d’Italia and the Vuelta a Espana are similarly challenging, but probably less well known at least to casual followers of the sport. For Lance Armstrong, winning the Tour was all that mattered – everything else was just preparation. The Tour has suffered the taint of alleged and proven cheating by competitors almost since its inception in 1903. As in many other power and endurance sports, athletes have sought advantage through the use of various drugs, sometimes with tragic consequences. In 1967, British rider Tom Simpson collapsed while climbing Mont Ventoux and died. He was seriously dehydrated, in part because Tour regulations at the time limited riders to two bottles of water per stage, but an autopsy also revealed the presence of amphetamines in his blood and amphetamine pills were found in the pockets of his jersey. Two-time Tour winner and mid-20th century cycling legend Fausto Coppi when asked in an interview if he had used drugs to enhance performance replied “yes, whenever it was necessary”. Asked when it was necessary, he responded “almost all the time”. In Coppi’s day, it should be noted, drug use was permitted. Doping then, has many precedents within the sport and it would be hard to know with certainty, which legendary performances were “clean” and which were not. Different drugs and techniques have fallen in and out of favour among competitors as regulations and testing have evolved. The challenge for users has always been maximizing the benefits while minimizing the risk of detection. By the time Lance Armstrong became a professional and set his sights on the Tour, erythropoietin (EPO), testosterone and human growth hormone (HGH), as well as other drugs, were widely used, but it appears that EPO and blood doping were the keys to achieving significant gains in performance. EPO used to enhance performance is a synthetic version of a naturally occurring protein. It works by stimulating the body to produce more red blood cells, which increases the capacity of the blood to carry and deliver oxygen to hard-working muscles thus increasing endurance. In a way, in the 1990s, it was a perfect storm because there was no test for EPO until 2000 and the only way its use could be regulated was by measuring its effect on haematocrit levels, i.e., the percentage of blood made up of red blood cells. That level varies person to person and is typically around 41% – 42%, but the regulators decided that as long as a rider’s haematocrit did not exceed 50% they were “clean”. If their haematocrit was found to be in excess of 50%, they were suspended for fifteen days, barely a slap on the wrist. This was almost an invitation to riders to use EPO. It’s easy to understand the temptation of using an undetectable drug that, in simple terms, would increase oxygen-carrying capacity by a fifth. It is also easy to imagine the impact that such an increase in oxygen-carrying capacity would have on the performance of an already highly trained and incredibly fit athlete – and the advantage it would confer over non-using rivals. Former Armstrong teammate Tyler Hamilton in The Secret Race: Inside the Hidden World of the Tour de France: Doping, Cover-ups, and Winning at All Costs, described how he and his teammates, including Armstrong, were not just beaten, but destroyed in the races they contested when they first attempted to scale the heights in European cycling without chemical assistance. Hamilton also outlines how, at some point, any new rider would come to the fork in the road where they must decide whether to hold to their principles, their possibly naïve beliefs and aspirations of doing it clean, or start following the path that so many others had already chosen. Perhaps what sets Lance Armstrong apart from the rest is that he didn’t just want to level the playing field, he appears to have wanted to tilt it in his favour. And so he did, with stunning results. Armstrong became a modern day legend with seven consecutive Tour victories and an Olympic bronze medal. He became his own brand and leveraged his fame to establish the Livestrong charitable foundation. Through the former, he influenced thousands, if not millions of people to take up cycling and boosted the profile of the sport, at least in North America, to a previously unimaginable level of popularity. And, through the latter, he gave hope to countless other people that they, as he had done, could overcome cancer. He became one of the highest earning athletes anywhere and enjoyed multiple commercial endorsements. And he did it all by out-competing his opponents on and off the bike, and by relentlessly adhering to his no-dope narrative and castigating, or worse, those who dared to cast doubt on it. This, however, is not a simple, black and white story. Yes, he’s been exposed and has confessed to most, if not all, of his wrongdoing. And it’s true that he took money under false pretense and that he’s likely going to be forced to return some of it. It’s also true that he treated some people, including some who were close to him and who aided his success, very badly. What’s remarkable is how moral outrage has soared as rapidly as Armstrong has fallen. Remarkable because on balance, and for all his deception, it could be argued that he did more good than harm. Unlike the bankers, still unpunished, who perpetrated a fraud so massive that it all but dropped the global economy to the floor and caused harm to millions of innocent people, Armstrong’s biggest offence is that he misled his sponsors, the world of cycling and his supporters. Part of the narrative is still true; he is a cancer survivor who beat the odds spectacularly and, irrespective of whatever tangible impact his charity has had on cancer research and support, he provided a positive message that many people have born witness to. The problem for Armstrong, consistent with the story of Faust, is that once he made his pact with the devil the deal did not end there. With each passing year and Tour victory he was forced to tie his own narrative into ever more convoluted and restrictive knots. The myth of Lance was like an inverted pyramid, a huge structure resting on a single point – the lie that he must propagate and defend in perpetuity if the whole edifice was not to ultimately tip over and crush him. His sponsors, in the wake of the USADA (US Anti-Doping Agency) report and the subsequent stripping of his titles by the sport’s governing bodies, have all jumped ship which means that, for the most part, they enjoyed the benefits of the pre-fall Armstrong reputation and have now been able to neatly sever their ties to him and avoid any blowback. His foundation too, has ended its relationship with him. If we think of these entities as shareholders of the enterprise he headed up, they’ve generally done pretty well with their investment over time. There is evidence to suggest that many successful corporate executives are psychopaths or have psychopathic tendencies. They willfully deceive people, with a notable lack of remorse, they lack empathy and they place their own interests at the center of all that they do. Is this behaviour so different from Armstrong’s? And is it possible that some of these people’s success is contingent on making a Faustian bargain as Armstrong’s was? The difference between Armstrong’s behaviour and that of many other successful people is the scale and highly public nature of his deception. Strike his messy public downfall from the record and Armstrong’s résumé ticks all the boxes – he’d be one hell of a candidate for that vacant CEO’s seat. In plain, black and white, moral terms, Armstrong’s conduct was inexcusable. From a different perspective perhaps this is just life imitating art. The rewards, both real and imagined, were so enticing that he made the deal – and now, tragically for both Armstrong and all those who believed in him, he has been called to account. This entry was posted in Motivation by colinwright2012. Bookmark the permalink.